Going today to look at the new TLX. Own 2001 TL with 292K miles and '13 TL, both bought new. However leaning toward buying '18 Audi S5 sportback. Gorgeous car and gobs of power. The TLX will need to impress the crap out of me to stick with the brand. Yup same here going in also to look at the new TLX but I am also heavily leaning towards the A5 SportBack. Audis reliability has been much better & consumer reports recommends the A4 & Q7. As long as you get Audi care and if you plan on keeping the car past 40k miles then get Audi Select and it will take you up to 90k. Having had a couple of Audis, I agree that their reliability has improved. Where they have "gotchas" are the costs associated with "routine" maintenance. It's really high. Then again, same can be said for Mercedes or BMW (out of the warranty period). I don't believe Mercedes is built or engineered any better than an Acura, either. Yeah....they may have some unique build and engineering that they've done. Wouldn't call it necessarily better, though. I've never owned a Porsche. But, talking to those who did and still do, they concur that they are very robust in their engineering and their build. None of them have had any issues with their cars. Any German cars maintenance is high but its not that bad, but most buyers of german cars buy pre-paid maintenance and you can buy up to 90,000 miles. Plus most german cars are leased. The A-Spec is a very attractive package but I don't think it will even remotely compare against the A5 SportBack, if you have the money go with the Audi. Do all 5 LEDs light up as daytime driving lights? I know the outer 3 light up when turned "on" but I haven't seen pictures showing all 5 lit up when on "drive". Do they? Also, can you have the fog lights on while only having the amber led tube on and that's it? Do all 5 LEDs light up as daytime driving lights? Don't know. Never looked, as I'm usually driving. I know the outer 3 light up when turned "on" but I haven't seen pictures showing all 5 lit up when on "drive". Do they? See Above! Also, can you have the fog lights on while only having the amber led tube on and that's it? No! 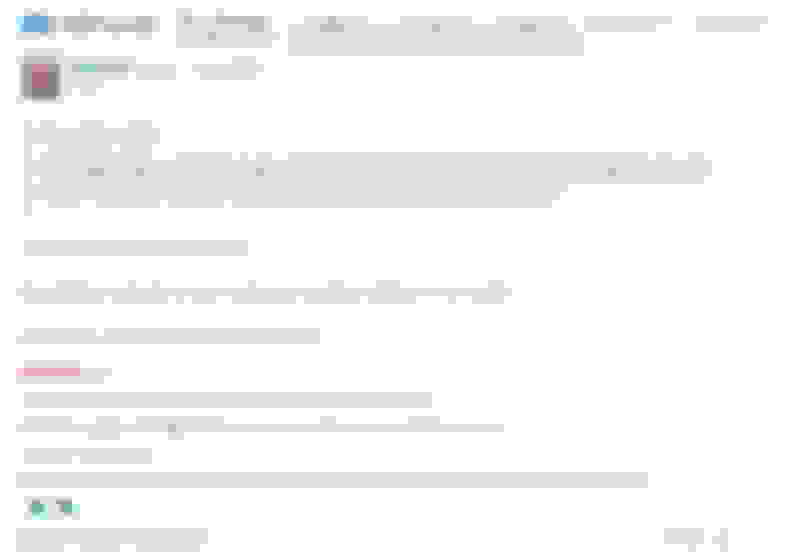 See answers in bold italic. I will say that the headlights are the best I've ever had, regardless of how many LEDs are lit. And, That includes all the light pipes I had on a recent Cadillac CTS. All 5 LEDs are on when used as daytime running lights. Yeah....Audi and Mercedes urges you to "pre-pay" for maintenance. On my previous S4, the maintenance plan was about $900 for 4 services (mostly oil changes and tire rotations). That averaged out to $225/service. BMW used to cover maintenance for 4 years, now they're down to 3 years. Have never priced BMW service plans since they were mostly covered. I've heard after warranty maintenance is high, however. By year 4, she'll need tires, maybe brakes, too. So, that numer will be even higher. If I save the specials they send me, oil change, complet check up and tire rotation is $60. Brake job $180. Tires....they say they'll match any deal I bring them. Acuras are WAY less expensive to maintain. And - your local Honda shop can do much of the regular maintenance work for you at a better rate than the Acura blokes. At least in my neck of the woods that's the case. My TLX needed the camera re-calibration in the windshield since I just had a new one put in from the hail damage repair (which the repair is a whole different horror story and why I'm getting rid of my car next year lol), and while I was at my dealership I had to test drive the '18 A-Spec! As a '15 V6 owner, this 2018's transmission definitely felt better. No hesitation when downshifting, and the shifts are also smoother, it's as good as this 9spd is going to get. BUT I feel like it's been a little exaggerated on here that the transmission is just so amazing now and a million times better than the old one, because in the end it's still the same boring 9spd ZF that limits the car's power. Don't get me wrong it still drives well, but after driving a '17 A4 with the 7spd dual clutch for a week, THAT is how the TLX should feel. I still think my '16 MDX's 9spd feels better and feels more torquey. The new intake or whatever they put in the A-Spec sounds AWESOME though. You hear it on test drives on Youtube, but it's so much better in person when you're driving. It's not a small noise, it's heard anytime you put your foot down and it sounds REALLY good. 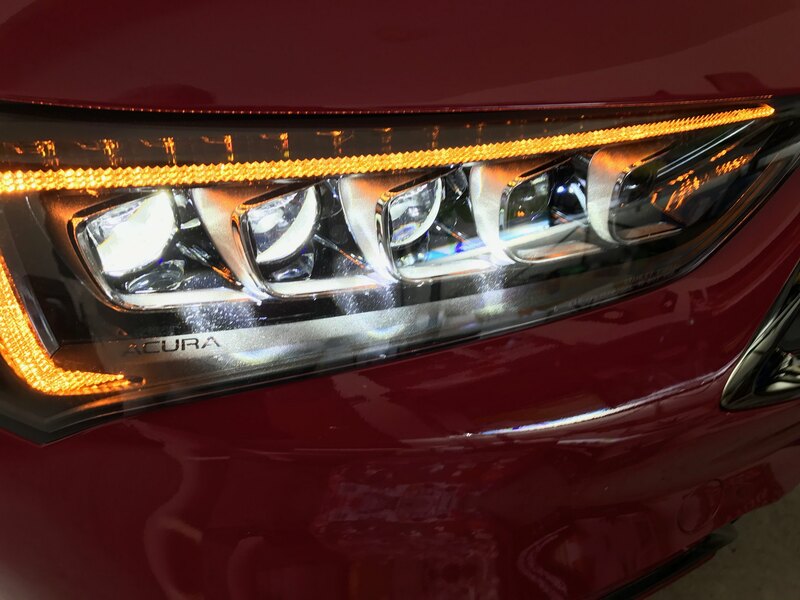 Acura did a great job with the refresh, so bravo to them for giving the customer what they've been asking for. Not trying to get off topic here, but I had a '17 A4 (2.0T Quattro Premium) as a rental while my TLX was getting its hail damage fixed, and I fell in love with the car. Before I got the A4 rental, I only was considering the '18 TLX for my next car. But that quickly changed, the A4 has such a nice ride and drives so well. Very quick and light on its feet, perfect transmission, and so much low end torque. Just take a look at the new A4 if you're considering the TLX, because I thought the TLX was the perfect car for me until I drove this A4. Back on topic, if I weren't so hung up on the A4, I would be dead set on the A-Spec. I'm not buying a new car until next year, but it'll be a tough decision between the two cars. I pulled over into a neighborhood to snap a couple pics of the demo since it was blue and looked really cool. This A-Spec (FWD) was $43,800 I believe, which is a great value for everything you get in the A-Spec package. Last edited by atl7; 06-13-2017 at 12:53 PM. I'm in the same boat. Not buying until next Spring and I've been all over the A4. But now with the Aspec, I've been going back and forth. Biggest difference is I would want the A4 in Prestige and the cost would be higher than the Aspec. I will have to make a decision at that time if it's worth the extra $ for the Audi. I'm a loyal Acura buyer and my dealer is literally 10 minutes away..so servicing etc is so easy..that will also be a factor as the closest Audi dealer is much further away. I would be buying the Premium Plus Quattro, which is about $6k more than the TLX. It would be hard to buy the A4 because of how great my Acura dealer (Mungenast Acura) has been to me. At least we have time to decide, but I think I'm going to end up with the Audi. Time for a change, the '18 is really sporty and all, but still feels like the same TLX to me as it should since it was just an MMC. But if you haven't driven the A-Spec, go test drive one! The intake (I believe that's what they added?) on it is ridiculous, in a good way! I'm really impressed with what they did with the car. Yea, I think the German brands are more reliable these days. But the maintenance costs are still well above what you'd normally pay for a Japanese car. The parts and labour are just quite a bit more. One of the local Acura dealers here in Cali called me this morning offering to obtain a SHAWD Advance or Aspec for me. Wanted me to come in to talk numbers. Told him no need simply provide me by email what you're willing to do. Got a response of $700 off list. With other cars in the class selling for thousands of dollars off sticker it behooves me how they can expect to sell the car at the offered price. I can only suppose they're waiting on Acura to throw in some cash. I'll wait too. I've done some researches on what people are getting off for A4's. Most say it's anywhere between 4%-6% off. You automatically get 6% if you belong to some Audi club..but others have said they have received that even without it. I would think 5% off for a normal negotiation would be easy to do. I've bought my last two cars over the July 4th weekend. I played dealers against each other and they were begging for my business. I always go to multiple dealers and get best and final offers. With invoice prices being pretty easy to find, you shouldn't be paying extreme amounts over that unless it's an extremely hot car. I would think the Aspec is hot right now, but it won't last too long as numbers need to be hit. That is true. You do pay more for repairs for German cars. True Car right now shows $4k off a $48k A4 AWD Premium Plus. I was with my sister in NY when the dealer had her test drive a new A4 Premium Plus AWD while we were waiting for her A3 Prestige to be serviced. We both drove the car. Much softer/less visceral road feel (and driving engagement) than her 2015 A3 Prestige Quattro with Sports suspension and sport seats. But the A4 was very quiet and drove very competently, albeit not very engaging. Did notice the Audi interior cost cutting, especially the seats and door panels (the door speaker grills alone red flag the bean counters ruthless determination) on the new A4 vs her 2015 A3 Prestige. When we inquired on price we were told about $4k off sticker and that A4 listed for $46.5K. This was at the #3 Audi dealer in the country, Biener Audi in (Great Neck LI) New York. The "Sport" seat option in the Audi's make a world of difference. IMO once the 2018 Accord (and perhaps too the 300+ HP V6 more aggressive Camry) is introduced, the TLX's will see more aggressive discounting. I saw the 2018 Camry at the auto show (white with Black roof option and Red Leather) and was shocked at how good it looks. Actually if one was looking at a A4 they could get more then 6% off. They could get 10-12% off easy. So I had the chance to drive the TLX A-Spec today. Went to my local dealer & our salesperson was in today & I asked him if I could test-drive a TLX A-Spec & he went and got one that just came off the truck and took off the plastic covers that were inside the car so I could drive the car. The car drove really nice & the exhaust was loud. I really liked the car, but I was not a fan of the transmission & the ELS Audio System was not that great to me. I did not ask what kind of deal we could get on one. The dealership had one Still Night Blue Perl TLX A-Spec in the Showroom & this San Marino Red one that just came in. To be honest it felt like it was as fast as my parents 16 RLX Advance Packaged car. I think Acura did a good job on making this car better but if they had upgraded the sound system, I would buy one as I am in the market for a new car. 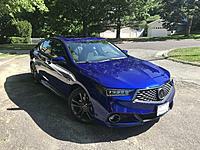 I would love to stay with Honda/Acura but I also like the A5 Sportback and I know its a higher priced car, so I need to decide between the two but overall I think Acura has made a reasonable amount of changes & that exhaust man does it sound good. Last edited by comptr; 06-13-2017 at 05:42 PM. Could you elaborate on the transmission. Everyone seems to be saying that the ZF9 is vastly improved over the previous versions and that the new transmission is "perfect".....very interested in specifics if you could. To be fair I have never driven the previous version of the TLX & the only recent Acura I have driven is my parents 2016 RLX Advance. Maybe its just me but I did not like the shifter & was not a fan of the transmission. I like the one in the RLX better. Ha, then that's still over msrp by $50 then. Greedy dealerships. . .There are dealer cash incentives from Acura for $750 on the ASpec's currently. And $2000 if you lease. . .
Last edited by Speed_Racer; 06-13-2017 at 07:23 PM. Not everyone. Some have said it feels the same as the 2017. Some have said its marginally better. Who knows where the truth lies. Where are you seeing dealer cash? I was told no dealer incentives are available in the US currently. comptr, thanks for some feedback on the ELS audio system. I have been looking for some feedback from other new buyers on it. I held off on buying a 2017 TLX-Advanced because I thought the audio system did not sound as good as in my 05TL. I was hoping the upgrade would improve the sound quality as well. Sorry to hear there has not been an improvement there. However I will definitely test drive an A-Spec and an Advanced to hear for myself, and only hope I hear some improvement. I have been with Honda/Acura for a long time and really want to purchase this new version of the TLX. I have a feeling the truth lies somewhere in between. 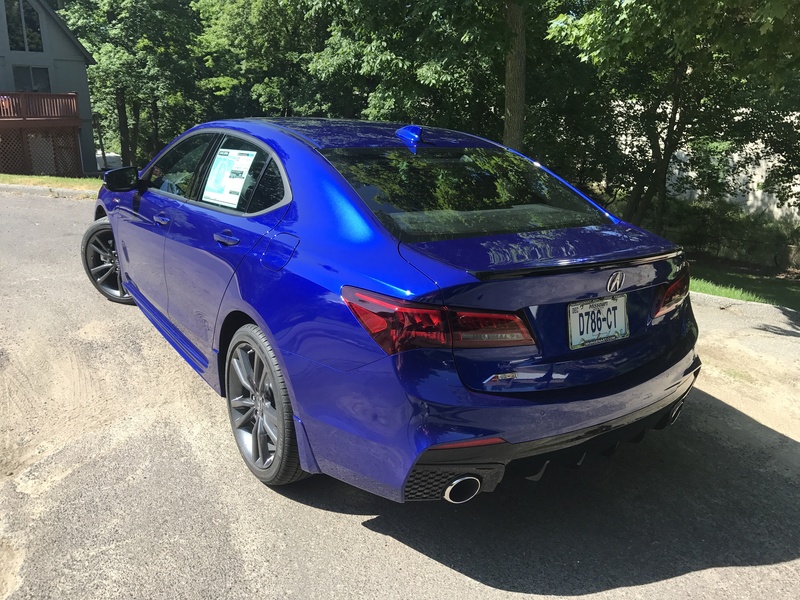 It seems to me that the TLX took a really large leap with this facelift and it is possible that Acura tuned the ZF9 to behave a little differently in the A-spec vs the regular TLX. But with that in mind, the ZF9 still uses 2 dog clutches and no amount of tuning or programming can change that. So it will always be slightly laggy. The other thing is that other things were probably changed too like the suspension and steering feel and possibly even pedal calibration and these things can add up to make the car "feel" more sporty. I'm sure it is much improved though over the 2015 models since that seems to be the one most people here have switched out of. Last edited by RDX10; 06-13-2017 at 09:35 PM. First saw it on Edmunds leasing forum then a dealer here confirmed I could apply it. I wish I could find a more concrete source like from Acura directly, but we all know they don't share that with the public. I think most dealers won't reveal it's there hoping to cash in on the initial wave of a "new model". If the incentives are actually there dealers are making upwards of almost $5k profit for people paying MSRP right now on leased TLX's. Last edited by Speed_Racer; 06-13-2017 at 10:03 PM. Hmmm. I will have to keep that in mind. Thanks! I have a 2015 with a replaced transmission and from the talks of what I was reading on here, this updated ZF 9 in the '18 A-Spec was going to be PERFECT. Depends on what you want perfect to be- comfy or sporty. I will say it's smooth, and it shifts nicely and there's no hesitation really to upshift. BUT that doesn't mean it shifts quickly, as a dual clutch would. Which is what this car needs to drive as sporty as it looks. So yes, if you're looking for a smooth transmission that gives a comfy ride, it's great. But the tuning is still off on this transmission, there's such a lack of low-end power. And I know Acuras aren't torque rich like the Germans but none of my other Acuras have struggled so much to give power in the first few gears. All in all, it was updated nicely to make for somewhat quicker shifting and less hesitations, but it's still the same boring 9spd ZF. Yup. I saw that on Edmunds yesterday. I'm hoping to make a deal/order this month and trade out of my current RLX hybrid, pending test drive. The transferrable perks of leasing an Acura will likely keep me in the brand. My other choice is the 2016 RLX SH on my dealer's lot. If I can get a stellar deal on that, it'll RLX #2. If not, it'll be an A-Spec. Nice, you can't go wrong with either choice. I'm sure you'll let us know the type of incentives you get. Aren't their salespeople from Acura dealers on this board that can confirm these incentives? 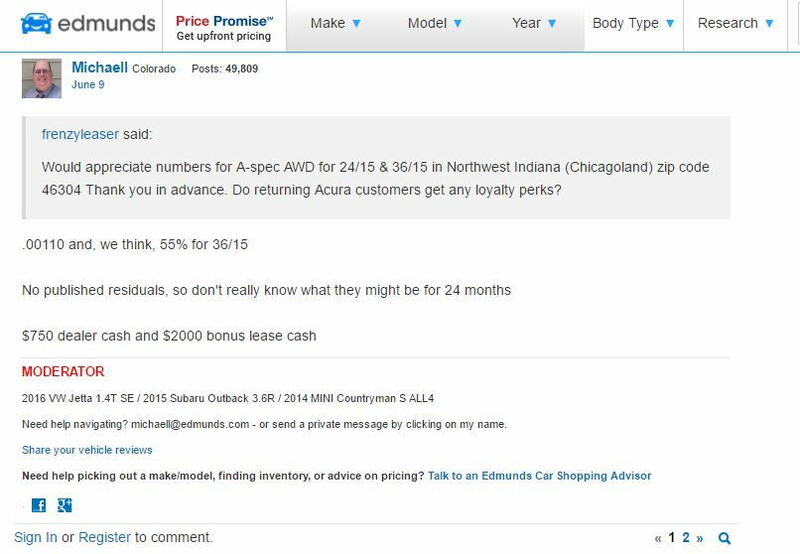 Forgot to mention that the quoted incentives from Edmunds are also stating they expire July 5. Wow... so basically the car can be had at 5k to 6k off msrp... not bad for a car that just came out.